Department of Physiology, Faculty of Basic Medical Sciences, University of Uyo, Uyo, Nigeria. well as future reproductive impairment. proportion of these workers are of reproductive age . significantly to systemic toxicity . documented in experimental animals . 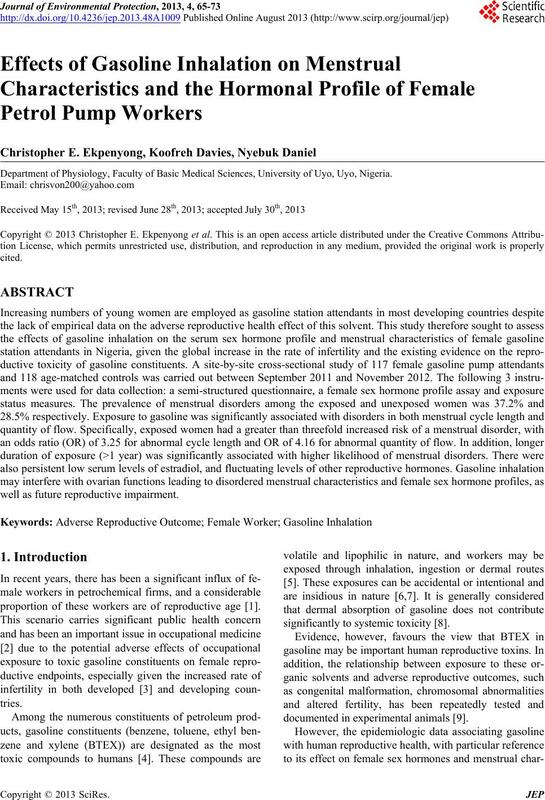 peak of reproductive age) into this occupation in Nigeria. associated with exposure to BTEX compounds [20-22]. reproductive organs, would be valuable. attained, i.e., primary, secondary or tertiary education. 1), low stress (2 - 3) or high stress (≥4). who had worked for more than one year. search into menstrual cycles [23,24]. past three months or more. number of sanitary pad required during menstruation. were single, 27.7% were married, and 1.3% was divorced. cycle length (P = 0.009) and quantity of flow (P = 0.002). 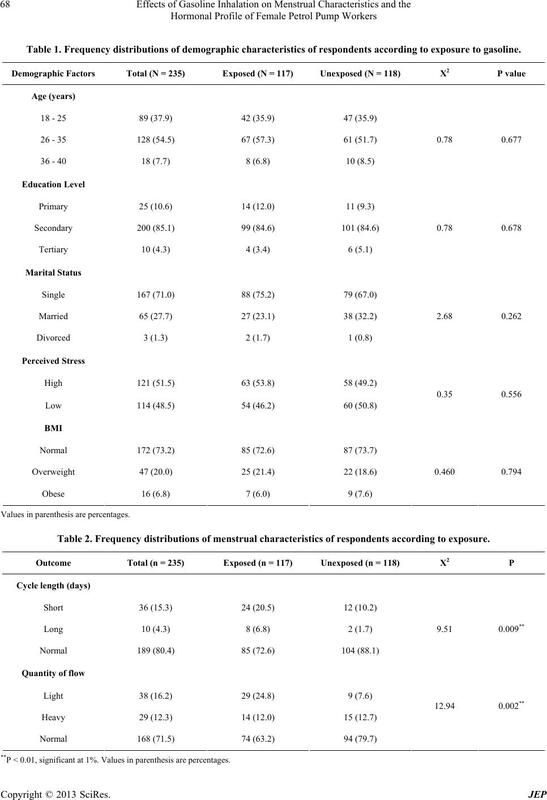 20.3% for unexposed women, respectively (Table 2). 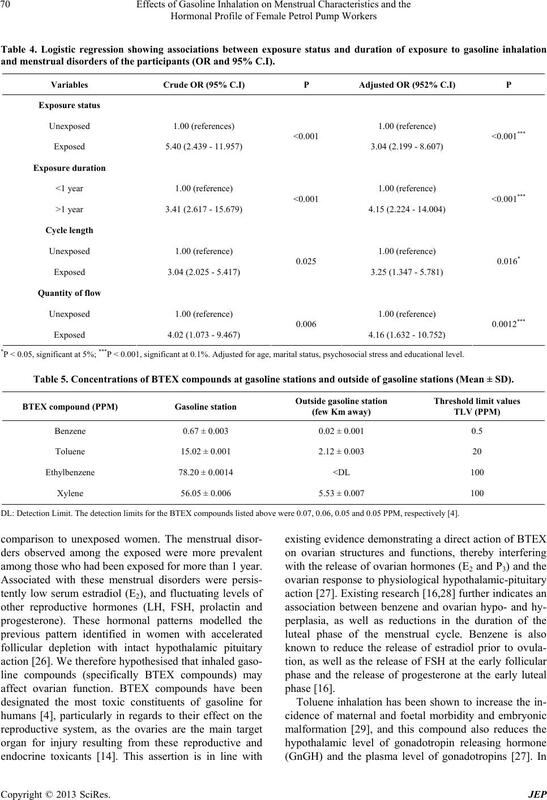 gesterone and prolactin) fluctuated (Table 3). Table 1. 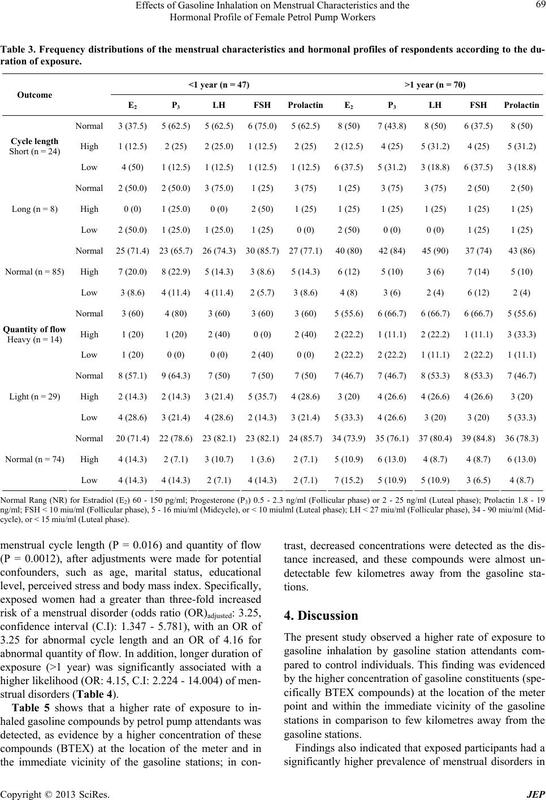 Frequency distributions of demogr aphic characteristics of respondents according to exposure to gasoline. Values in parenthesis are percentages. Table 2. Frequency distributions of menstr ual characteristics of respondents according to exposure. **P < 0.01, significant at 1%. Values in parenthesis are percentages. cycle), or < 15 miu/ml (Luteal phase). 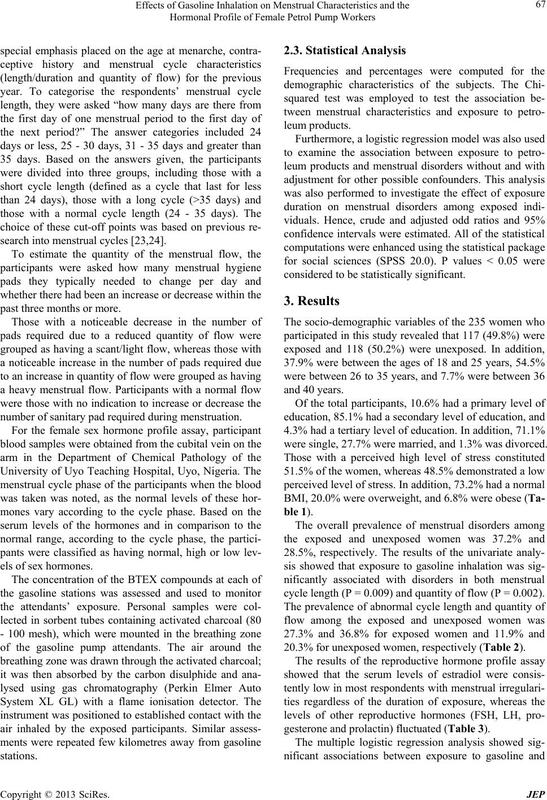 and menstrual disorders of the participants (OR and 95% C.I). *P < 0.05, significant at 5%; ***P < 0.001, significant at 0.1%. Adjusted for age, marital status, psychosocial stress and educational level. Table 5. Concentrations of BTEX compounds at gasoline stations and outside of gasoline stations (Me an ± SD). DL: Detection Limit. The detection limits for the BTEX compounds listed above were 0.07, 0.06, 0.05 and 0.05 PPM, respectively . among those who had been exposed for more than 1 year. and peak reproductive ages, respectively. by the study of Sexton et al. .
was conducted at gas stations in the Yaza province. observed in the present study. several modifiable and un-modifiable confounders. D. H. Kim, H. Lee, C. K. Lee, D. S. Kang, J. H. Kin, J. T.
Springer-Verlag, New York, 1997, pp. 107-164. M. R. Azari, Z. N. Konjin, F. Z. Salehpour and M. D.
 R. Cecil, R. J. Ellison, K. Larminaa, S. A. Margary, J. M.
CONCAWE Report, CONCAWE, Brussels, 1997. Journal of Emergency Medicine, Vol. 3, No. 5, 1985, pp. Vol. 26, No. 1, 2002, pp. 81-89. 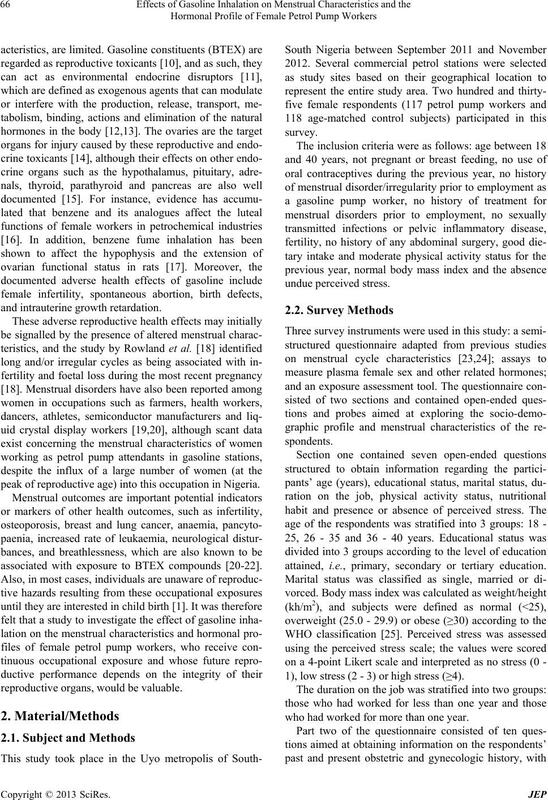 C. C. Ugwoke, E. D. Nwobodo, P. Unekwe, M. Odike, S.
Nigerian Journal of Physiological Sciences, Vol. 20, No. Workplaces,” Wiley, New York, 1997. New York, 1999, p. 421.
mental Health Perspectives, Vol. 104, No. S4, 1996, pp. D. R. Mattison, D. R. Plowehalk, M. J. Meadow, A. Z.
Vol. 74, No. 2, 1990, pp. 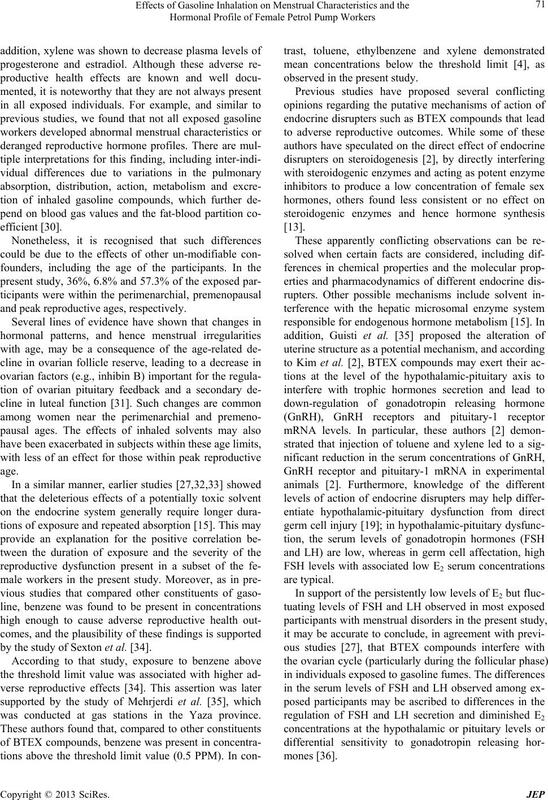 391-411.
perimental Biology, Vol. 47, No. 7, 2009, pp. 537-549. Sheng Yan Jiu, Vol. 29, No. 6, 2000, pp. 351-353. S. Rowland, D. D. Barid, G. Longs, S. D. Wegienka, M.
Epidemiology, Vol. 13, No. 6, 2002, pp. 668-674.
cet, Vol. 349, No. 9062, 1997, pp. 1385-1388. C. C. Lin, C. N. Huang, Y. H. Hwang, J. D. Wang, S. P.
Medicine, Vol. 63, No. 1, 2013, pp. 45-52.
terminal,” Environmental Science and Engineering, Vol. 48, No. 3, 2006, pp. 175-182. G. Toft, A. Axmon, C. Lindh, A. Giwereman and J. P.
lutants,” Human Reproduction, Vol. 23, No. 1, 2008, pp. Societal Influences,” WHO, Geneva, 2000, pp. 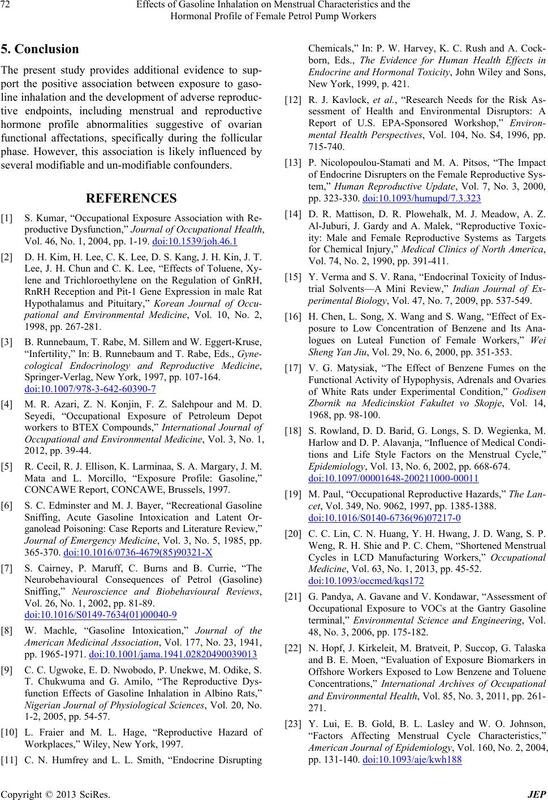 118-122.
pause,” Human Reproduction, Vol. 7, No. 10, 1992, pp. V. Sirotkin, A. Kâdas, A. Balâžá, Z. Baková, Z. Halim, A.
Harrath, A. V. Makarevich, A. Kolesárova, P. Chrenek, J.
ences, Vol. 32, No. 2, 2012, pp. 517-525. 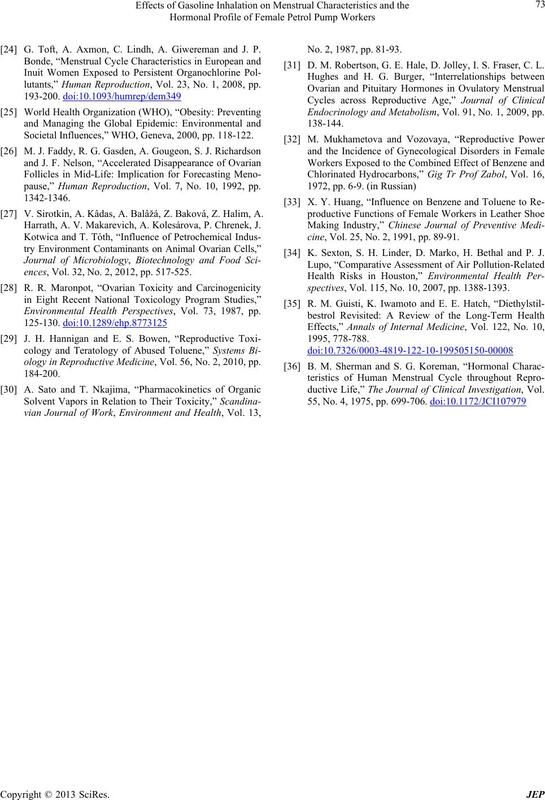 Environmental Health Perspectives, Vol. 73, 1987, pp. ology in Reproductive Medicine, Vol. 56, No. 2, 2010, pp. No. 2, 1987, pp. 81-93. D. M. Robertson, G. E. Hale, D. Jolley, I. S. Fraser, C. L.
Endocrinology and Metabolism, Vol. 91, No. 1, 2009, pp. cine, Vol. 25, No. 2, 1991, pp. 89-91. K. Sexton, S. H. Linder, D. Marko, H. Bethal and P. J.
spectives, Vol. 115, No. 10, 2007, pp. 1388-1393.
ductive Life,” The Journal of Clinical Investigation, Vol.